A COMMUTERS DREAM!! Located within walking distance to the commuter rail and a quick drive to Oak Grove, Routes 1, 93 and 95, commuting is a breeze from this fabulous 2 bedroom/2 bath corner unit condominium. Only 1 year young, this unit is nothing short of immaculate! Bathed in afternoon sunlight, the open concept kitchen, dining and living area boasts high ceilings, granite countertops, an over-sized peninsula and stainless steel appliances. Two spacious bedrooms with walk-in closets, 2 gorgeous full bathrooms, in-unit laundry room and balcony complete this light, bright and airy living space. Neutral tones and gleaming hardwood floors throughout. 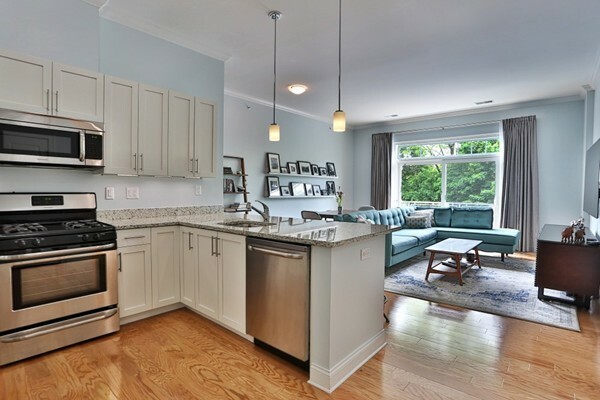 With so many conveniences of condo life ~ central air, elevator, 2 deeded parking spaces (1 under) and 2 private storage units and just a stroll away from the restaurants, coffee-houses, and stores of bustling downtown Melrose! Dont miss out on a rare opportunity to own a unit at Tremont 130! See MLS for additional info!